A Frac Tank is used to hold water, or a proppant, when a well is being fractured. The material is held in a Frac Tank and connected by a hose or pipeline to a pump that will flow it down the wellbore at a high pressure to push open the formation and the proppant is used to keep it open. 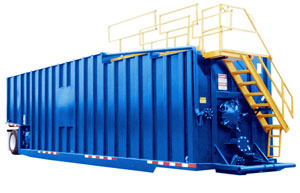 The Frac Tank is a large heavy gauge steel tank that is pulled by a tractor to a job site. A typical application may have a vacuum pump truck fill the tank with a drilling fluid containing salt water, acid and pebbled mud which is then pumped into the well to fracturize the earth during the drilling operation. 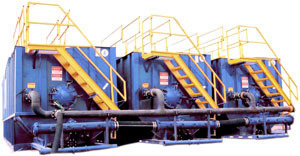 Frac Tanks are specially designed to allow all of the fluid to be able to be emptied from the tank without the need to slope the tank to allow complete evacuation as waste is often quite costly. The floor of a frac-tank is modified to obtain complete emptying of the fluid regardless of the slope of the ground on which it rests. 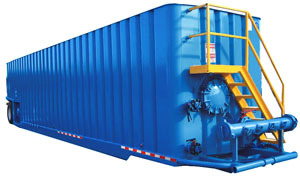 Another object of this Frac Tank design is to prevent all of the fluid from resting up against the front wall of the tank by providing converging pitched portion on the floor for the full length of the tank so as to provide a central low point where the fluid is made available to a contiguously located exit pipe through which it is sucked out by means of a vacuum pump.